Overview: Non-Toxic, tested FREE of Lead, BPA's and Phthalates; Meet or exceed the US regulated toy safety standards. Easy to clean with damp cloth & mild soap. Interlocking feature and lightweight make it very simple to assemble. With high density EVA foam, the 0.4'' thick premium mat comfortably cushions spine, hips, knees and elbows on hard floors. With double sided non-slip surfaces, BalanceFrom puzzle mat comes with an excellent slip resistant advantage to prevent injuries. With extra boarders, you can not only make one big piece of area, or a few smaller areas according to your house room combinations. 36-Tile: Item comes with 36 tiles in 9 colors and 54 end borders (6 boarders each color). Each tile measures 24"x24"x0.4". Each Square = 1 square foot; Total coverage 36 square feet (6' x 6' area). 16-Tile: Item comes with 16 tiles in 4 colors and 24 end borders (6 boarders each color). Each tile measures 24"x24"x0.4". Each Square = 1 square foot; Total coverage 16 square feet (4' x 4' area). 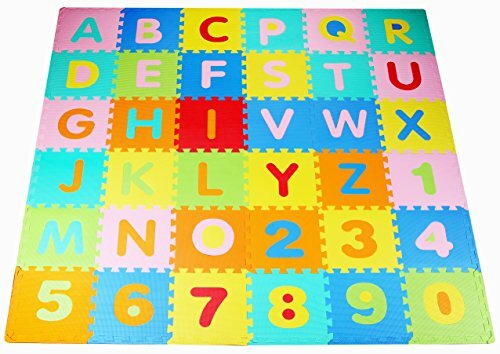 Alphabetic: Item comes with 36 alphabetic tiles in 7 colors and 54 end borders (6 boarders each tile). Each tile measures 24"x24"x0.4". Each Square = 1 square foot; Total coverage 36 square feet (6' x 6' area). If you have any questions about this product by BalanceFrom, contact us by completing and submitting the form below. If you are looking for a specif part number, please include it with your message.